While many agree that making a good cup of espresso is an art within itself, latte art refers to patterns made in the foam topping espresso drinks. If you want to get in touch with your inner barista (expert in coffee preparation), latte art is a critical skill which can take years to master. Pour enough milk for one cup into the steam pitcher. Put the steam wand at the bottom of the pitcher. Turn on the steam, and slowly raise the wand until it is near the top of the milk. Lower the pitcher as the milk rises so the steam wand stays 1 cm away from the top of the milk. The milk should not stretch too much nor should there be any big bubbles. Create a smooth, velvety milk as opposed the foam that sits atop most espresso drinks. Allow the milk to reach 80 ºF (27 ºC), then place the steam wand on the side of the pitcher, deep into the milk, positioning the pitcher to spin counterclockwise. Keep doing this motion until the milk heats to 150 ºF to 160 ºF (65 ºC - 70 ºC). Shut the steam and remove the steam wand and thermometer from the milk. Clean the steam wand with a wet cloth. Vigorously swirl the milk. If you see any bubbles, pound the pitcher on the counter several times and go back to swirling the milk for 20 to 30 seconds. Do this even while the espresso is pouring. Start pouring the milk into the espresso. To create a flower pattern, pour the milk into the bottom part of the cup, about an inch (2 cm - 3 cm) away from the bottom. Once the cup is about half filled, shake the pitcher back and forth while slowly moving it backwards. The flower design will move forward, filling the cup. Do this with a shaking motion originating at the wrist instead of moving your hand back and forth. Once the milk reaches the top of the cup, quickly pour the milk up the center of the pattern you created. Use a minimal amount of milk to avoid sinking the flower pattern. Embellish the design using stencils, powder, and milk foam. This step is optional, as many prefer to limit their latte art to "free form" methods, but you may want to experiment with the possibilities added by "etching." To write a word, such as "love" in the picture, melt milk chocolate and using a pin as a paintbrush drag the melting chocolate over the foamed milk. 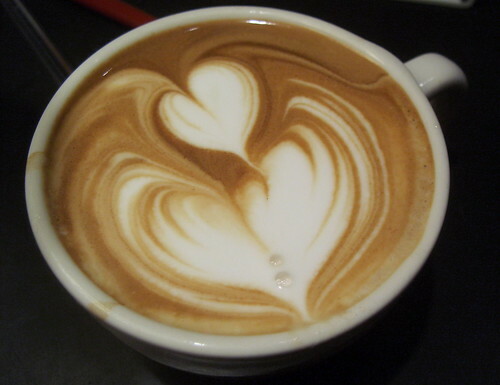 If you want to pour a heart pattern, shake as before without moving backwards as much. Form a ringed circle then slowly pour milk through the center to make a multi-layered heart. The espresso must be perfect. 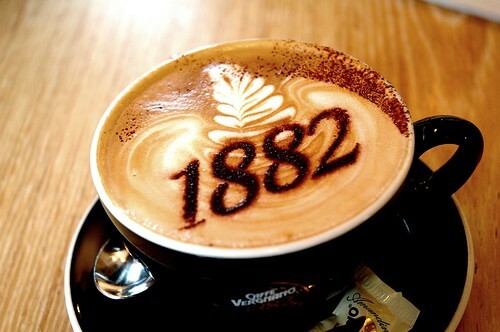 You must use an espresso machine with a proper brew head and boiler and enough steam power to properly froth the milk. These machines can cost at least $500. Before trying this with milk, try it first with water. While water doesn't have the same consistency as milk, practicing with water will allow you to get familiar with pouring and shaking at the same time. Use fresh milk for every cup, even if you have milk left over from the previous cup. Start with very cold milk -- keep the temperature right above freezing. Also, make sure you keep the steam pitchers refrigerated. Cold milk and steam pitchers will give you more time to create the smooth and velvety texture needed for latte art. Use a cup with a wide mouth. 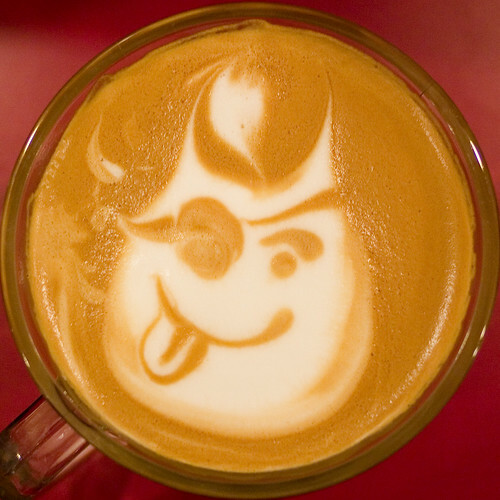 It will allow you to see the developing latte art design more easily. Do not let the milk heat to over 160 ºF (70 ºC), as this will limit the sweetness of the milk.